These may be called 'Little Lemon Tarts' but there sure is nothing little about their flavor. Lemons are like little balls of sunshine, they bring joy to everything they take part in. That being said, it must be nice to be a lemon! And it must be even lovelier to be made into a pretty little tart and enjoyed by many. 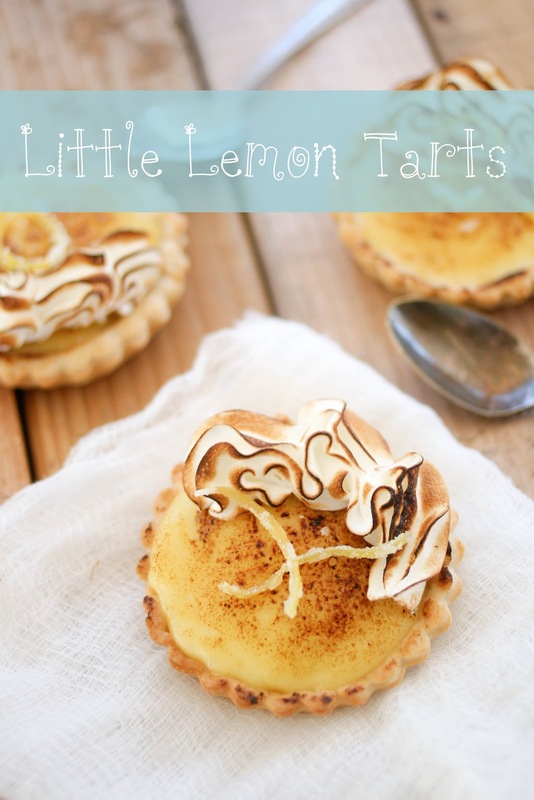 These lemon tarts have many counterparts, but really you could easily simplify them. 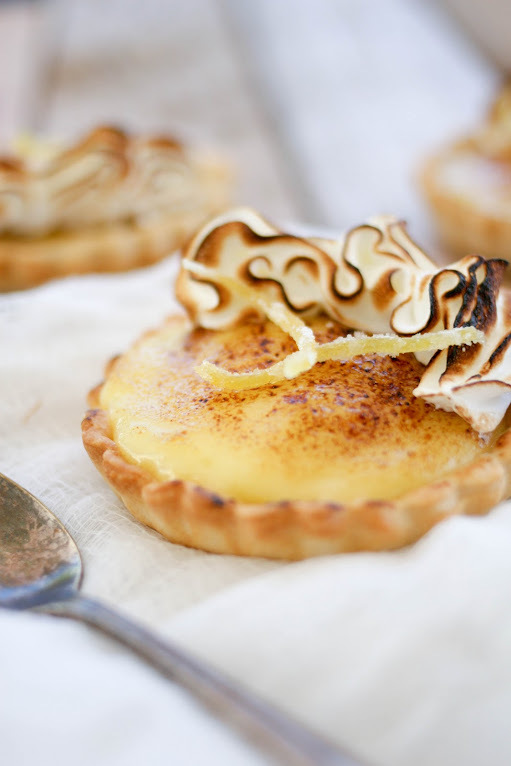 The candied lemon peel and meringue are not necessary but just pretty little add-ons. But don't get me wrong though, they are delicious little add-ons! 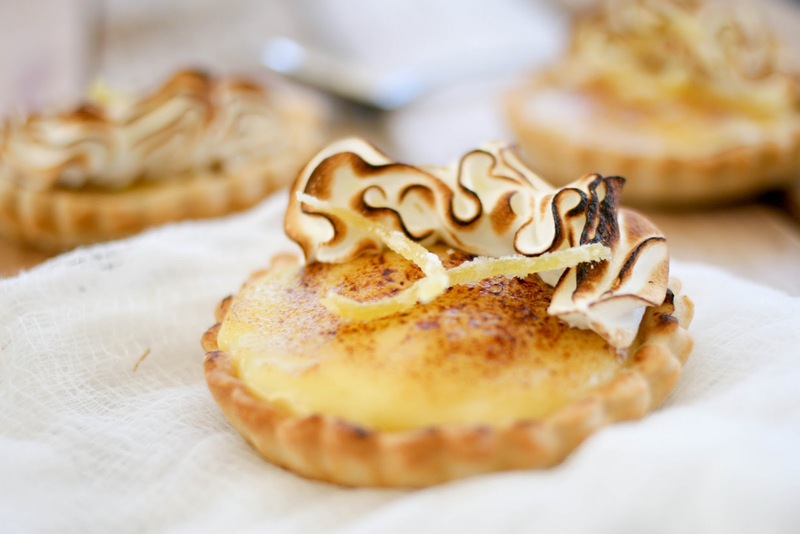 I really loved the lemon sabayon of this tart - it was the perfect balance of sweet and tart. The tart dough, on the other hand, was less loved. Though it was easy to make and put together, it wasn't my favorite tart dough. It shrank, which made it stumpy and thick. I made it again using a sugar cookie dough which I liked a lot more. It was nice and chewy and added a perfect sweetness. Sabayon recipe here. Tart dough recipe from Dessert Fourplay by Johnny Iuzzini. To make the tart dough, put the flour, sugar, salt, baking powder in a food processor and pulse to combine. Add the butter and pulse until the mixture is crumbly. Add 1/2 cup of the milk and pulse again until the dough starts to come together. Turn the dough out into a bowl and gather it into a ball. If the dough is still a bit dry, add a little more milk, tossing the dough with your fingers (you may not need all of the milk). Shape the dough into a brick, wrap in plastic and refrigerate at least 1 hour before serving. The dough will keep for 3 days in the refrigerator and for several months in the freezer. Defrost before rolling. To pre-bake, roll out the dough to fit your mini tart pans. Bake at 350 F for 10 - 12 minutes or until golden brown. To make the sabayon, bring about 1 1/2 inches of water to a boil in a pot that is slightly smaller than the diameter of the bowl you will be using for the sabayon. Meanwhile, in a large metal bowl, whisk the whole eggs plus additional egg yolks and sugar for about a minute or until the mixture is smooth. Set the bowl over the pot and, using a whisk, whip the mixture while you turn the bowl (for even heating). After about 2 minutes, when the eggs are foamy and have thickened, add 1/3 of the lemon juice. Continue to whisk vigorously and, when the mixture thickens again, add another 1/3 of the lemon juice. Whisk until the mixture thickens again, then add the remaining lemon juice. Continue whisking vigorously, still turning the bowl, until the mixture is thickened and light in color and the whisk leaves a trail in the bottom of the bowl. The total cooking time should be 8 - 10 minutes. Turn off the heat and leave the bowl over the water. Whisk in the butter a piece at a time. The sabayon may loosen slightly, but it will thicken and set as it cools. Pour the warm sabayon into the tart crust and place the pan on a baking sheet. Preheat the broiler. While the sabayon is still warm, place the tart under the broiler. Leaving the door open, brown the top of the sabayon, rotating the tart if necessary for even coloring (this will only take a few seconds, so do not leave the oven). Remove the tart from the broiler and let it sit for at least 1 hour before serving. To make the meringue, combine the egg whites and sugar in the metal bowl of an electric mixer. Bring an inch of water to boil then place the metal bowl on top. Whisk constantly until the sugar is completely dissolved. Once dissolved, remove and place back into the electric mixer. Whisk until peaks form, about 5 - 7 minutes. 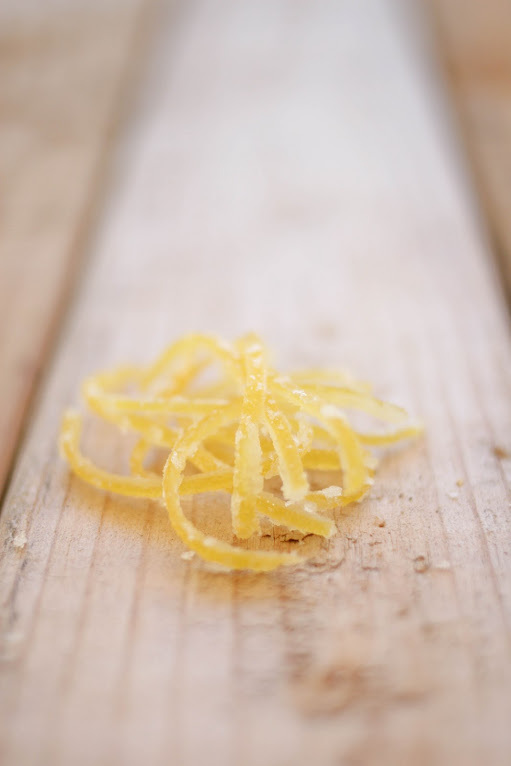 To make the candied lemon peels, remove any excess white piff from the peels (this is the bitter part), then slice the peels however you'd like. Bring the water to a boil, then add the lemon peel and boil for 5 minutes. Remove the peels, add the sugar to the hot water and bring to a boil again. Toss the lemon peels back in and boil until translucent (about another 5 minutes). Drain the peels then toss them in some sugar to coat. Let them dry on a counter for about 2 - 4 hours. To assemble, spoon the lemon sabayon into the pre-baked tart shells. 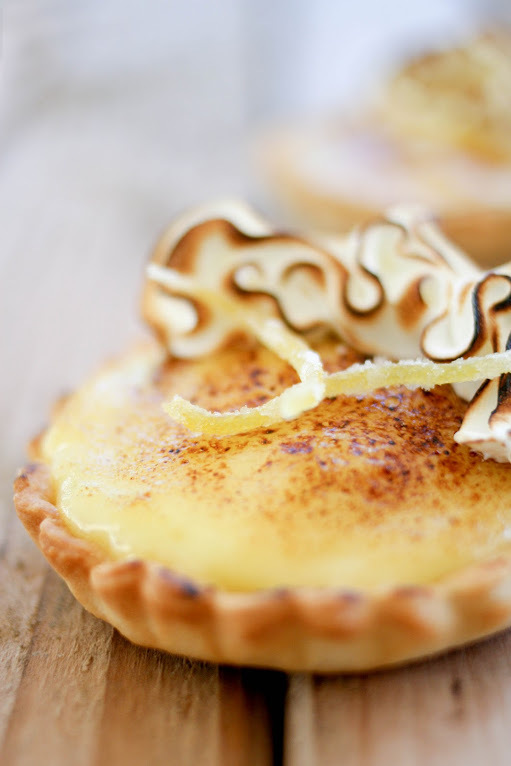 Pipe the meringue on top of the lemon sabayon in whatever fashion you'd like, then top with some candied lemon peels! This is a feast to the eyes and the stomach in a package! Nice work! I love how the meringue looks like ruffles. This looks so delicious I can almost taste it! I want to do this tarts, but I am afraid if i will be successful as you. Michelle, this truly looks like a perfectly baked lemon tart (I´m tired of seeing tons of underbaked tart shells this days on the blogosphere). I think the contrast between the crispy tart shell with the foamy buttery sabayon is just heaven on earth. This is somewhat confusing... do we pour the sabayon into the mini tart shells and broil? and then top with meringue and broil again? Or do we pour the sabayon into the tart shells, then top with meringue and then broil? Your meringue looks like it was broiled so please clarify the instructions as I would like to try this. @ Anonymous: Sorry for the confusion! You pour the sabayon into the mini tart shells, then you can broil either once or twice - depending on your preference. If you want the entire sabayon top to be broiled, broil it, take it on, pipe on the meringue and torch it/ broil it again. OR, you could pour in the sabayon, pipe on the meringue, then torch or broil the entire thing. I like using a hand torch to broil since it's easier and you can control the broiling process directly! Michelle: Thanks so much for the clarification! These look absolutely wonderful! I Michelle! These look fabulous! I can't wait to try. However what I find confusing are the quantities asked for the sabayon. Is that per mini-tarte that you need 1 egg and 1 yolk. It seems way too small to be for either the big tart or 8 mini ones. And furthermore in the directions you refer to "eggs" and "Yolks" (plural) so could you please clarify? Thanks! @ Sophia: Sorry about the recipe being confusing! The sabayon recipe makes enough sabayon for 8 mini tarts or 1 large tart. I adjusted the recipe to clarify the eggs/ yolks part!